UPDATE: Baltimore County police say Leverne Doran, 68, has been arrested and charged – click here for details. A man was arrested after climbing onto a Baltimore County school bus on Thursday afternoon. The incident took place in the vicinity of Putty Hill Avenue at Hoerner Avenue in Parkville. Witnesses say the man tried to jump onto the bus after he claimed that a student threw an empty Gatorade bottle at his car. 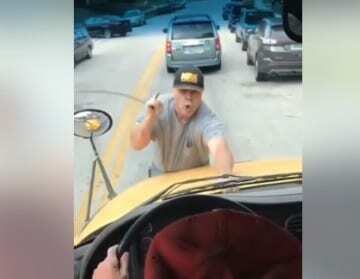 The man initially tried to enter the school bus, but the driver wouldn’t let him aboard. That’s when the man climbed atop the vehicle, which was transporting students from Loch Raven Academy. The driver then decided to slowly drive to the Parkville police precinct with the man on the hood of the bus. Police say the man was arrested without further incident. The student who allegedly threw the bottle received a three-day suspension from school. View dramatic footage from the incident below.